When It Comes To Rock Work, We Make Your Vision A Reality! Are you interested in adding rock or stone accents to your home? At Ware Fencing, we offer a large variety of fencing and stone services to our clients. The type of fencing, as well as any other landscape additions you invest in, can dramatically affect the value of your home. That is why quality craftsmanship and customer satisfaction are our primary priorities. If you are interested in installing a rock fence, or any type of stone wall fencing in Crowley and Fort Worth, TX or the surrounding areas, you can count on our professionals to do the job right. Give us a call at 817-948-4503 today to speak to one of our friendly associates, and to learn more about our services! There are plenty of reasons to choose stone work on your home’s landscape. Stone is a durable material with aesthetic charm dating back centuries. It provides durable, and long-lasting appeal as well, which is always a boost for property values. At Ware Fencing, we offer many fencing services, which includes our stone wall fencing, but we also perform specialty stone works. If you’d like to add stone or brick support columns to your iron or aluminum fencing, we can provide you with a low-maintenance result that will provide a customized flair. We can also add rock or concrete retaining walls for your gardens. Our concrete retaining walls offer more affordability, but our rock retaining walls have a distinctive appeal that stands out from the rest. If you need a walkway to complete your landscaping, we also offer professional flagstone walkway installations according to your specifications. There are plenty of ways we can incorporate stone and rock into your landscape, and for a more affordable price than you might think! 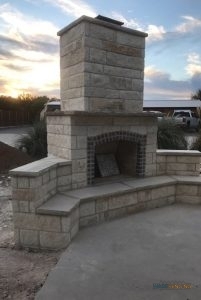 We have years of experience providing high-quality stone work and stone wall fencing to the Crowley and Fort Worth, TX area, and we are dedicated to providing excellent work for our clients. From walkways to customized elements, our contractors are some of the best in the industry. While we specialize in fence repairs and replacements, don’t doubt our additional services! Give us a call today at 817-948-4503 to learn more. Our expert contractors are always ready to assist clients when it comes to choosing the ideal fence or stone system for their property. We always take into consideration your personal style, your requirements, and your budget. Why wait? Let us make your vision a reality today! Flagstone Walkways Flagstone walkways are traditionally seen in luxury settings, but our team can provide a surprisingly affordable installation you’ll love! Rock & Concrete Retaining Walls Rock or concrete retaining walls are perfect additions to any landscape, residential or commercial. Rock & Brick Fence Columns Fence columns made from rock or brick are much more durable than regular fencing, as well as very appealing. Updated on September 20, 2018 at 9:11 am by Ware Fencing.